While Anonymous—a decentralized and leaderless organization whose members work in unison on the Web to act in protest—has been a prevalent presence online, it’s not often that you encounter them in the good ol’ IRL. 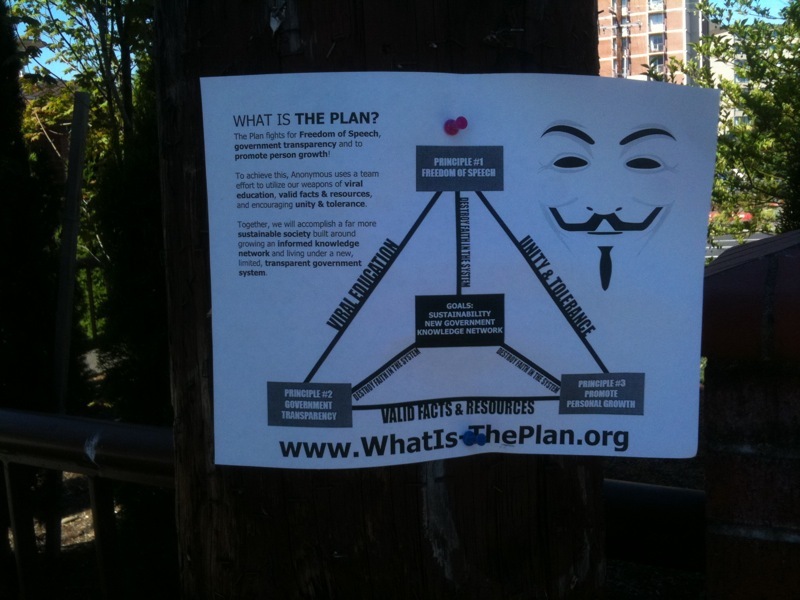 Well, not without a Guy Fawkes mask at least. Until now. Take the opportunity to wander around southwest Portland today and you might encounter paper Anonymous bills posted on telephone poles. And more were spotted around town. This one by @lunarobverse. Now I’m curious… Are folks encountering these around town or elsewhere in the US? Please report in with photos and locations if you are. It would be interesting to see if this is an isolated incident or something widespread. Reidpar shared this one from NE MLK and Wiedler. Wow, this Old Spice campaign is really getting interesting! Where will it go from here? Seeing this truly excites me because people are finally getting involved and demanding change outside of the normal re-election year hype. Regardless of what its “those anonOPs faggots,” the “real anonymous”, or any other third party, whats most important here is the message they are trying to convey — Government transparency, protection of universal freedoms and rights, etc. There is a saying I see quite often: “Haters gonna hate” and whats most upsetting about what you wrote is that you seem to “hate” without knowledge or insight into what it is your talking about. @ gh0st I meant that as a pun. Not as a suggestion. almost certain this is those anonOPs faggots, not the real anonymous. I’ve had one report from Dallas, TX; one from Spokane, WA; and Portland reddit has spotted a few. This is bigger than the United States. This is global.